Call us for your repair on difficult to locate Caterpillar Excavator Hydraulic Pumps. HTS Excavator Hydraulic Pump Repair Center can repair your Caterpillar Excavator Hydraulic Pump. We offer a one stop shopping center for all Caterpillar Excavator Hydraulic Pumps. We offer Caterpillar Excavator Pumps and Caterpillar Track Hoe Hydraulic Pump Repair, Caterpillar Excavator Hydraulic Pump Exchange, New Caterpillar Excavator Hydraulic Pumps and We Sell Caterpillar Excavator Hydraulic Parts for Caterpillar Excavator Hydraulic Pump Repair. We offer Repair for all Caterpillar Excavator Hydraulic Motors. HTS Excavator Hydraulic Pump Repair Center and HTS Track Hoe Hydraulic Pump Repair Center offer Caterpillar excavator pumps. We also sell Hydraulic Parts for Caterpillar Excavators or Caterpillar Track Hoes. We offer Repair for Caterpillar Excavator Hydraulic Motors, Excavator Hydraulic Motors, Caterpillar Tandem Excavator Hydraulic Drives, Caterpillar Excavator Hydraulic Pump Components, All Caterpillar Excavator Hydraulic Pump and Caterpillar Track Hoe Hydraulic Equipment and all foreign Caterpillar hydraulic pumps, Caterpillar Excavator Hydraulic Pumps. We also sell New or Remanufactured Excavator Hydraulic Pumps and all terrain crane Hydraulic Pumps for the following equipment, Doosan Excavator Hydraulic Pumps and Doosan All terrain Crane Hydraulic Pumps. Hydrostatic Transmission Service offers New or Remanufactured Excavator Hydraulic Pumps and all terrain crane Hydraulic Pumps for the following equipment, Daewoo Excavator Hydraulic Pump or Daewoo All terrain Crane Hydraulic Pumps. For ten years we have offered New or Remanufactured Excavator Hydraulic Pumps and all terrain crane Hydraulic Pumps for the following equipment, Hitachi Excavator Hydraulic Pump or Hitachi All terrain Crane Hydraulic Pumps. Looking for New or Remanufactured Excavator Hydraulic Pumps and all terrain crane Hydraulic Pumps for the following equipment, Hyundai Excavator Hydraulic Pump or Hyundai All terrain Crane Hydraulic Pumps we have them. If you need cranes or hoists or New or Remanufactured Excavator Hydraulic Pumps and all terrain crane Hydraulic Pumps for the following equipment, John Deere Excavator Hydraulic Pump or John Deere All terrain Crane Hydraulic Pumps, we have them in stock. When you Need High Performance Excavators or Lifting Cranes, We also sell New or Remanufactured Excavator Hydraulic Pumps and all terrain crane Hydraulic Pumps for the following equipment, Kobelco Excavator Hydraulic Pump or Kobelco All terrain Crane Hydraulic Pumps. We invite you to Explore our Excavator Hydraulic Parts Page for New or Remanufactured Excavator Hydraulic Pumps and all terrain crane Hydraulic Pumps for the following equipment, Komatsu Hydraulic Pump or Komatsu All terrain Crane Hydraulic Pumps. When you need the world's leading brands for Industrial Cranes or New or Remanufactured Excavator Hydraulic Pumps and all terrain crane Hydraulic Pumps for the following equipment, New Holland Excavator Hydraulic Pump or New Holland All terrain Crane Hydraulic Pumps, call us first. We offer a comprehensive range of Industrial Cranes and Hoists Pumps and also sell New or Remanufactured Excavator Hydraulic Pumps and all terrain crane Hydraulic Pumps for the following equipment, Volvo Excavator Hydraulic Pump or Volvo All terrain Crane Hydraulic Pumps. HTS warehouses New or Remanufactured Excavator Hydraulic Pumps and all terrain crane Hydraulic Pumps for the following equipment, Link-Belt Excavator Hydraulic Pump or Link-Belt All terrain Crane Hydraulic Pumps. When you need New or Remanufactured Excavator Hydraulic Pumps and all terrain crane Hydraulic Pumps for the following equipment, Caterpillar Excavator Hydraulic Pump or Caterpillar All terrain Crane Hydraulic Pumps we have them. We also sell New or Remanufactured Excavator Hydraulic Pumps and all terrain crane Hydraulic Pumps for the following equipment, Liebherr Excavator Hydraulic Pump or Liebherr All terrain Crane Hydraulic Pumps. Excavator Hydraulic Pumps for New or Remanufactured Excavator Hydraulic Pumps and all terrain crane Hydraulic Pumps for the following equipment, Kawasaki Excavator Hydraulic Pump or Kawasaki All terrain Crane Hydraulic Pumps, is what we do. For High Performance New or Remanufactured Excavator Hydraulic Pumps and all terrain crane Hydraulic Pumps for the following equipment, Koehring Excavator Hydraulic Pump or Koehring All terrain Crane Hydraulic Pumps, call us first. We also sell New or Remanufactured Construction Excavator Hydraulic Pumps and all terrain crane Hydraulic Pumps for the following equipment, Samsung Excavator Hydraulic Pump or Samsung All terrain Crane Hydraulic Pumps. For multiple lines of New or Remanufactured Excavator Hydraulic Pumps and all terrain crane Hydraulic Pumps for the following equipment, Terex Excavator Hydraulic Pump or Terex All terrain Crane Hydraulic Pumps, we have them in stock. When you have a failure on New or Remanufactured Excavator Hydraulic Pumps and all terrain crane Hydraulic Pumps for the following equipment, Lorain Excavator Hydraulic Pump or Lorain All terrain Crane Hydraulic Pumps, let us be your one stop supplier. To avoid down time, we also sell New or Remanufactured Excavator Hydraulic Pumps and all terrain crane Hydraulic Pumps for the following equipment, Tadano Excavator Hydraulic Pump or Tadano All terrain Crane Hydraulic Pumps. 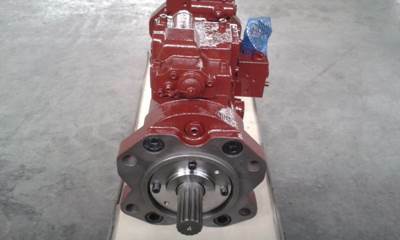 Quick turnaround repair is what we offer for New or Remanufactured Excavator Hydraulic Pumps and all terrain crane Hydraulic Pumps for the following equipment, Grove Excavator Hydraulic Pump or Grove All terrain Crane Hydraulic Pumps. To supply your needed New or Remanufactured Excavator Hydraulic Pumps and all terrain crane Hydraulic Pumps for the following equipment, American Excavator Hydraulic Pump or American All terrain Crane Hydraulic Pumps, call us at 800-361-0068. The majority of New or Remanufactured Excavator Hydraulic Pumps and all terrain crane Hydraulic Pumps for the following equipment, Demag Excavator Hydraulic Pump or Demag All terrain Crane Hydraulic Pumps, we have in stock. On hard to find New or Remanufactured Excavator Hydraulic Pumps and all terrain crane Hydraulic Pumps for the following equipment, Warner-Swasey Excavator Hydraulic Pump or Warner-Swasey All terrain Crane Hydraulic Pumps, we can help. Check our pricing on New or Remanufactured Excavator Hydraulic Pumps and all terrain crane Hydraulic Pumps for the following equipment, Krupp Excavator Hydraulic Pump or Krupp All terrain Crane Hydraulic Pumps. Check our availability on New or Remanufactured Excavator Hydraulic Pumps and all terrain crane Hydraulic Pumps for the following equipment, Franna Mac Excavator Hydraulic Pump or Franna Mac All terrain Crane Hydraulic Pumps. Check our website for New or Remanufactured Excavator Hydraulic Pumps and all terrain crane Hydraulic Pumps for the following equipment, P&H Excavator Hydraulic Pump or P&H All terrain Crane Hydraulic Pumps. For price quote on New or Remanufactured Excavator Hydraulic Pumps and all terrain crane Hydraulic Pumps for the following equipment, Mantis Excavator Hydraulic Pump or Mantis All terrain Crane Hydraulic Pumps, call us at 662-680-8899. HTS is here to help you with New or Remanufactured Excavator Hydraulic Pumps and all terrain crane Hydraulic Pumps for the following equipment, Drott Excavator Hydraulic Pump or Drott All terrain Crane Hydraulic Pumps. Please call us first for New or Remanufactured Excavator Hydraulic Pumps and all terrain crane Hydraulic Pumps for the following equipment, Bucyrus Erie Excavator Hydraulic Pump or Bucyrus Erie All terrain Crane Hydraulic Pumps. Let us quote you on your New or Remanufactured Excavator Hydraulic Pumps and all terrain crane Hydraulic Pumps for the following equipment, Gallion Excavator Hydraulic Pump or Gallion All terrain Crane Hydraulic Pumps. HTS offers competitive pricing for New or Remanufactured Excavator Hydraulic Pumps and all terrain crane Hydraulic Pumps for the following equipment, PPM ATT Excavator Hydraulic Pump or PPM ATT All terrain Crane Hydraulic Pumps. On New or Remanufactured Excavator Hydraulic Pumps and all terrain crane Hydraulic Pumps for the following equipment, Ban Tano Excavator Hydraulic Pump or Ban Tano All terrain Crane Hydraulic Pumps, we are very competitive. HTS services and sells New or Remanufactured Excavator Hydraulic Pumps and all terrain crane Hydraulic Pumps for the following equipment, Yanmar Excavator Hydraulic Pump or Yanmar All terrain Crane Hydraulic Pumps. Repaired and New or Remanufactured Excavator Hydraulic Pumps and all terrain crane Hydraulic Pumps for the following equipment, XCMG Excavator Hydraulic Pump or XCMG All terrain Crane Hydraulic Pumps are available. In Stock New or Remanufactured Excavator Hydraulic Pumps and all terrain crane Hydraulic Pumps for the following equipment, Manitowoc Excavator Hydraulic Pump or Manitowoc All terrain Crane Hydraulic Pumps. To see more Excavator Hydraulic Pumps and Excavator Hydraulic Motors that we support click HERE and HERE. *These are repair prices only. For exchange pricing there is a core charge added. 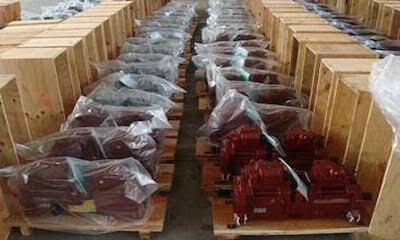 We also offer John Deere Excavator Hydraulic Pumps, Rexroth Excavator Hydraulic Pumps, Dynapower Excavator Hydraulic Pumps, Kawasaki Excavator Hydraulic Pumps, Vickers Excavator Hydraulic Pumps, Cessna Excavator Hydraulic Pumps, Denison Excavator Hydraulic Pumps, Link-Belt Excavator Hydraulic Pumps, Hydraulic Excavator Pumps, Excavator Hydraulic Motors. We repair Sundstrand, Eaton, John Deere, Rexroth, Dynapower, Kawasaki, Vickers, Cessna, Denison, Link-Belt, Hydraulic pumps or Hydrostatic Pumps. We pay top price for Excavator Hydraulic Pumps, Hydraulic Excavator Pumps and Excavator hydraulic motors, rebuilt Main Case Hydraulic Pumps. Caterpillar Excavator Hydraulic Pumps are designed and engineered for peak hydraulic performance. Each Caterpillar excavator hydraulic pump is designed to deliver Caterpillar excavator hydraulic pump pressure at a fingertip, joystick application. Caterpillar, has developed a Caterpillar excavator hydraulic pump that can create a positive bottom line for your company when using the Caterpillar excavator hydraulic pump system in your excavator. If there is a failure in your excavator hydraulic pump system, your hydraulic pump can easily be replaced with a new Caterpillar excavator hydraulic pump or your Caterpillar excavator hydraulic pump can be repaired with new Caterpillar excavator hydraulic pump parts. We also offer an exchange program where you send your failed Caterpillar excavator hydraulic pump core in, and we can send you a new or remanufactured Caterpillar excavator hydraulic pump. All of our Caterpillar excavator hydraulic pumps carry a one year warranty and offer a full money back guarantee. We usually can ship your Caterpillar excavator hydraulic pump in three days or so. Caterpillar excavator hydraulic pumps are designed to last a lengthy period of time when paired with the proper maintenance. 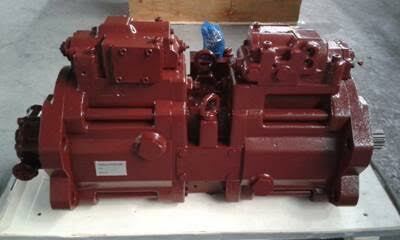 CALL US FOR YOUR REPAIR ON DIFFICULT TO LOCATE EXCAVATOR HYDRAULIC PUMP REPAIR. We exchange Caterpillar Excavator Hydraulic Pumps and we offer an option to save cash, an economic solution to purchasing OEM parts. Our remanufactured Caterpillar Excavator Hydraulic Pumps and Caterpillar Hydraulic Excavator Pumps are rebuilt using new internal Excavator Hydraulic Pump Parts and Hydraulic Excavator Pump Parts. A. The excavator hydraulic-hydrostatic pump reservoir must be cleaned out with diesel fuel or solvent and clean rags, then blown out with air. B. All excavator hydraulic-hydrostatic pump lines must be filled with diesel fuel or solvent and blown out backwards with air. C. All excavator hydraulic-hydrostatic pump fittings must have replacement o-rings installed. F. All excavator hydraulic-hydrostatic pump oil must be replaced, preferably with a 30 weight non-foaming rust and oxide oil. G. The excavator hydraulic-hydrostatic pump or motor must be physically charged with oil before connecting the excavator hydraulic-hydrostatic pump lines back to the unit, by filling the cavity of the units up with a funnel and oil. H. Attach all lines, fill up reservoir with oil, start unit for 20 seconds and cut off. Then, refill with oil again. I. 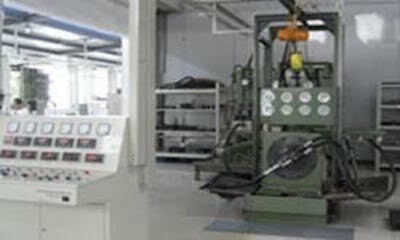 Any deviation from the above procedures will automatically void our warranty completely. J. If all the above conditions are met, we unconditionally warrant our product for one full year, parts only. This does not include labor to take off and put on. I, the customer, have read and fully understand the above procedures and certify that all procedures have been completed as requested herein. HTS is not an authorized Caterpillar dealer. © 2015 Hydrostatic Transmission Service, LLC.